Hartsville Branch of the NAACP monthly meeting The monthly membership meeting of the NAACP is set for Monday, February 18th at Jerusalem Baptist Church, 310 S. Sixth Street, beginning at 6 p.m. Come join the oldest civil rights organization. For more information, call Lunella Williams, Chapter President at 843-616-1294. Gospel in the Park Annual Black History program Gospel in the Park annual Black History Program will be Saturday, February 23rd at 3 p.m. held at True Saints Church of God in Christ, 428 Poole Street in Hartsville. The theme is Black and Proud. The keynote speaker is Police Chief Kelvin Washington of the Darlington Police Office. Entertainment by the amazing Wilson High School gospel choir of Florence. There will be a special tribute to five African Americans. For more information call Barbara Carraway 843-409-5241. Center for Science Education & Outreach offering ENGAGE GSSM, 401 Railroad Ave., is offering an after-school program to 6th, 7th and 8th grade students in Darlington County beginning February 25th-March 20th on Mondays and Wednesdays from 4 p.m.-5:30 p.m. The cost is free. There will be eight sessions of captivating STEM fun and opportunities to connect with GSSM’s residential students who will serve as instructors and role models. Snacks will be provided. For more information, contact Mrs. Irene Middleton at 843-383-3901 ext. 3309. HHS Class of 1962 Annual Class Gathering The HHS Class of 1962 is having their annual class gathering starting March 22-24. A letter of invitation is not being mailed to everyone. Individual expenses will be “dutch”. If you are interested in attending the Friday, Saturday or Sunday activities, please call Evelyn Dampier at 843-332-6426 to assure your reservation. Christian Recovery Christian Recovery meets every Thursday night at 7 p.m. at the Player House, across the street from Lakeview Baptist Church on Lakeview Blvd. All those struggling with addiction and family members are welcome. 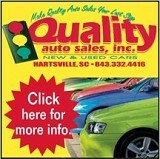 For more information, call 843-992-5222 or 843-307-7193. Senior Scene Enjoy a program focused on your well-being with refreshments and fellowship with friends on the first Thursday of every month from 10 a.m.-11 a.m. in the Education Classroom, directly before the Carolina Cafe’ cafeteria. Lunch and Learn Series Enjoy a free informative talk with a different physician each month over lunch on the third Thursday of every month from 12 p.m.-1 p.m. in the Education Classroom, directly before the Carolina Cafe’ cafeteria. 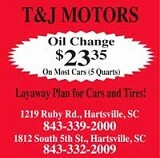 Please R.S.V.P for this event by calling 843-339-4563.